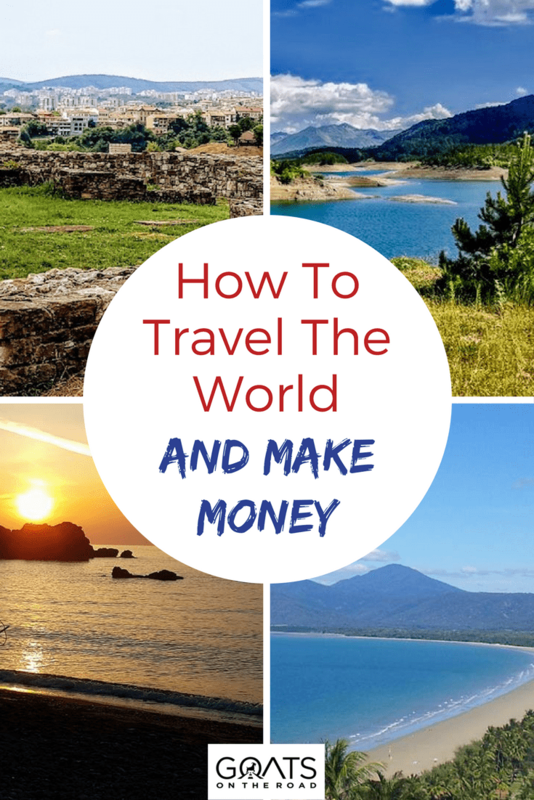 Do you want to travel the world, but aren’t sure how to get paid to travel? 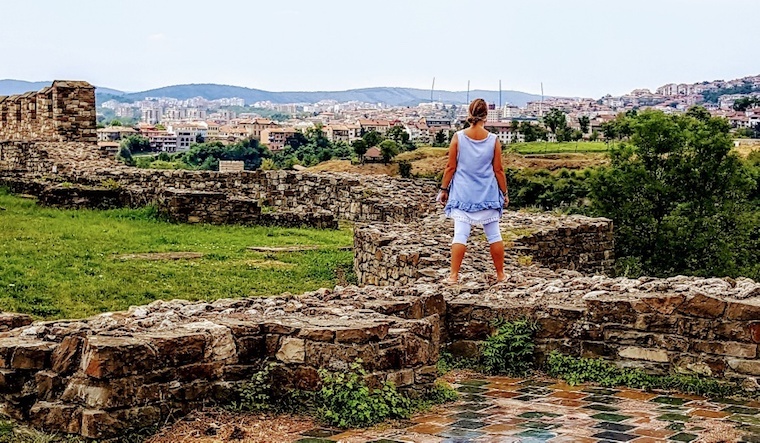 In this article we have an inspirational interview from Karen who shares her experience working as an online life coach, and as a travel blogger with her husband. Cool travel jobs, right?! 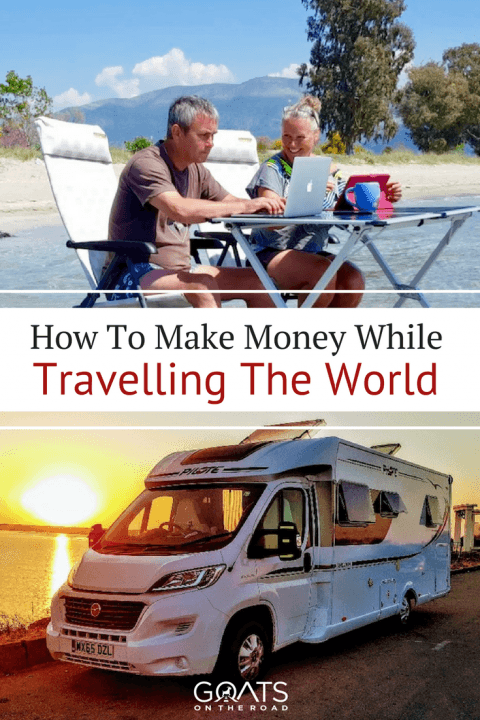 Karen and Myles are currently travelling around Europe in their RV, and they figured out how to make money online as they go. They have diversified their earning streams in order to be able to travel in a financially sustainable way. 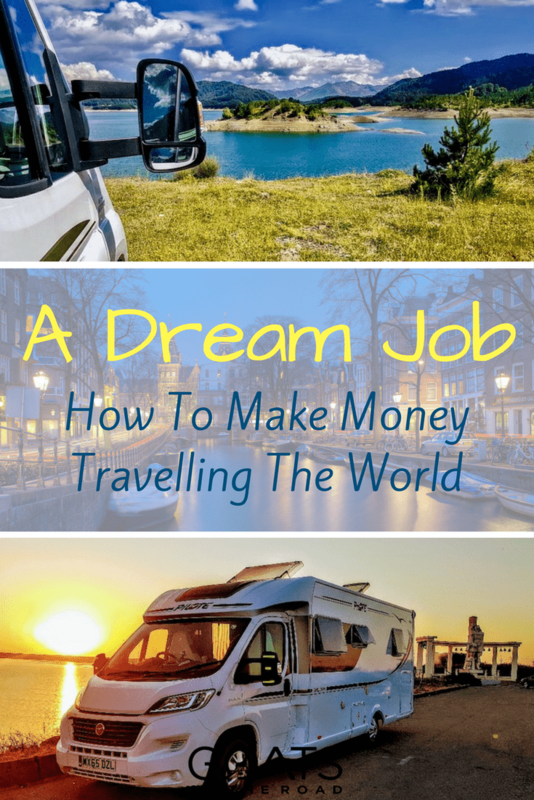 Not only do they make money from home (well, a motorhome) while being totally location-independent, but they are doing what they love! Read on to learn more. 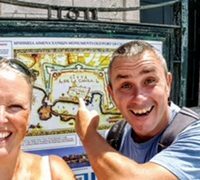 We are Karen and Myles, aka, The Motoroamers and after 30 years of corporate stress and self-employed submersion, we decided to take up the reigns of our lives and make some massive changes. 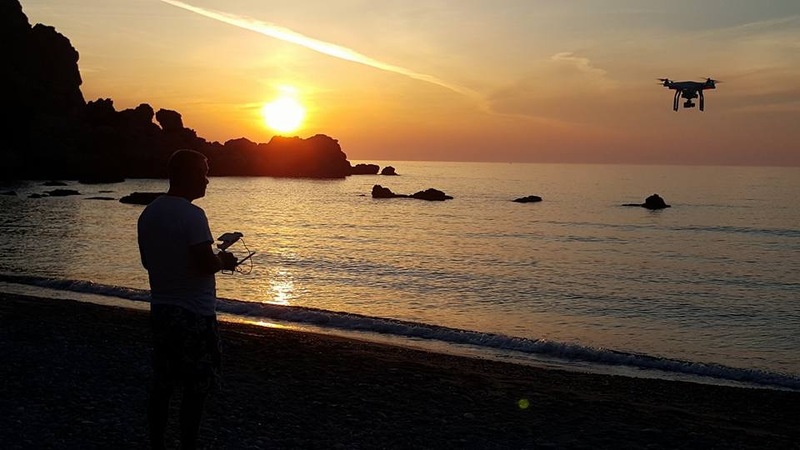 Within a four-year period we had sold our property on Isle of Man, UK, relinquished the hold on our business interests and relocated to Somerset to live the ‘good life’. Finally we could heal from our burnout. Yet despite for me, retraining and committing to a meaningful volunteering role, there was something missing. Even Myles’ valiant efforts to reduce his golfing handicap was not enough to soothe his soul. It took a six-week tour of New Zealand to show us the missing piece of our jigsaw. TRAVEL! New Zealand taught us how much exploration needed to be part of our lives and that we needed to feed our adventurous spirits. We wanted to empower our right to freedom from a system that tries to control us. When we got home, it was no surprise to hear Myles suggest that we buy an RV and go travelling for a year, whilst we sold property on Isle of Man. 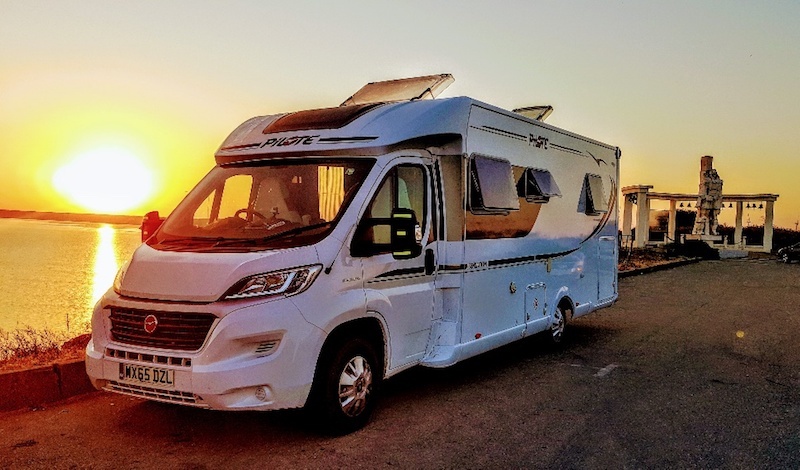 After battling my fears and ‘what if’s’, we bought our new travelling companion and by March 2016 we had packed up, packed in and headed off into the European sunset. Looking for other cool online jobs? 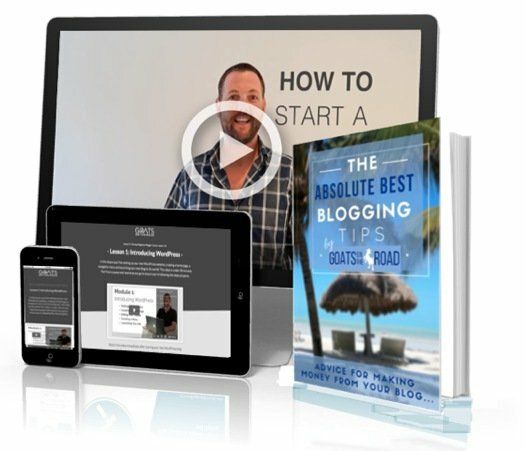 Goats On The Road have tried, tested and researched hundreds of cool jobs that you can do on the road, online and on the go so that you can make money from anywhere! Subscribe to learn about more amazing remote jobs like paid online surveys and how to get paid to write online! Two weeks into our ‘gap-year’ we realised this was more than just a year out – this was what we craved in our lives – forever. A life that nurtures my creative soul and feeds our adventurous spirits. Free to expand our minds with culture, language and life outside of the daily grind. Part of being on the road for us, is not just a holiday, that became clear within our first month. Certainly being tourists has its place, although what was more significant was our transition into digital nomads. Having run our own businesses, we recognised that we couldn’t simply stop working. We just needed to work in a different way that was more balanced, heart-centred and meaningful. So we started to explore how we could work whilst travelling and earn an income that sustained our lifestyle. After all, we moved from a six figure annual income to significantly less, almost overnight. I must add that we’re ‘not there’ yet – it’s a work in progress as we create a structure that flows with our hearts and not just the purse-strings. Our work platform centres around our skills, desires and what our potential audience might want from us. Combining this trio enables us to build something that nourishes us and helps others. Given our totally different personalities and skills, it was imperative to tackle this from two angles, exploring our expertise individually and collectively. First and most foremost, we needed our base-line! The essential income that we needed to feed our account so we could live day-to-day. This is primarily Myles’ domain as he has a really good eye for property and investment. So after selling our house in Isle of Man, we invested in three rental properties; two are still located on the Island and the third in the U.K. being managed by a property agent. The remainder of our capital Myles has invested into a share portfolio which includes Tax-free ISAs offered by UK government and medium risk FTSE100 businesses, which give us regular dividends. For me, my expertise lies in coaching and creative writing, both of which have served me well for over 25 years. Finding my niche in our new nomadic lives was easy when I stopped to reflect on the story of stress and burnout that led to our life-change. I had a ‘stress to happiness’ story to share and a huge audience to work with, suffering the same plight. Over the last year, with Myles’ technical capability, we built a new website that features my love for helping women find their inner happiness. Using my meditation teachings and my own personal insights, I focus my energies on publishing books, which give me bi-annual royalties, creating on-line programmes and coaching, which I do through email, telephone and Skype. I also use Social Media and a Facebook Group, Wake up to Happiness, to create a presence in the virtual marketplace and am currently allowing this to develop organically. Secondly, having these baseline elements in place, we now have the foundation to build the most exciting aspect of our remote working – how we turn our travels into a credible brand and income stream. Myles, with his humorous view on the world and my creativity makes us a formidable team and so The Motoroamers and our Seriously Entertaining Travel brand was conceived. We are still building our profile in this new arena and we have a way to go, although with approaching 1.7k followers on our FB page and affiliate marketing partnerships on our website, we are beginning, slowly to build our infrastructure. We focus on writing valuable content, sharing funny, ‘on the road’ insights and taking Drone videos that inspire our audience. The best bit about the framework we are creating is that our primary income allows us to do what we love without any stress. So different to the life we had before. Why Did You Decide to Leave Your “Regular” Jobs Behind? My love for helping people and making a difference drove my corporate work and my personal development and coaching consultancy. Yet as an introvert, whilst I was good at my job, it didn’t nourish my heart. I fought a constant battle with my need for financial security, on the one hand, forcing me to never turn a contract down, and my people-pleasing, perfectionist traits on the other. These two beasts pulled me into burnout with a thriving bank account. This did not bring the happiness and freedom I strived for, and something had to change – that something was me! So at breaking point, I pulled out of a $80,000 contract and started to put my needs first. It was one of the hardest things I’ve ever done although letting go of my business was vital to my survival. Over three years I pulled back until eventually I released my final client. Now it was time to find a role that nourished my introvert. I retrained in meditation and I started to find a more anonymous route to meeting my need to help others than the very public one I had been used to. This became the central part of my story and my realisation of how I could channel this into my virtual coaching services. As a partnership Myles and I knew we needed to be active and seized the opportunity to work in a different way that gave more meaning to us and the people we were looking to reach. And what better way than to blend our skills and our travels? The beauty of our approach is that we have been able to work in every country we’ve visited, that’s 11 so far in Europe, since March 2016. The rest of the world will wait for another year. We’ve been fortunate enough to call our office the beach, with sand between our toes, the swimming pool dressed in, not much to be honest, certainly no suits to be seen. 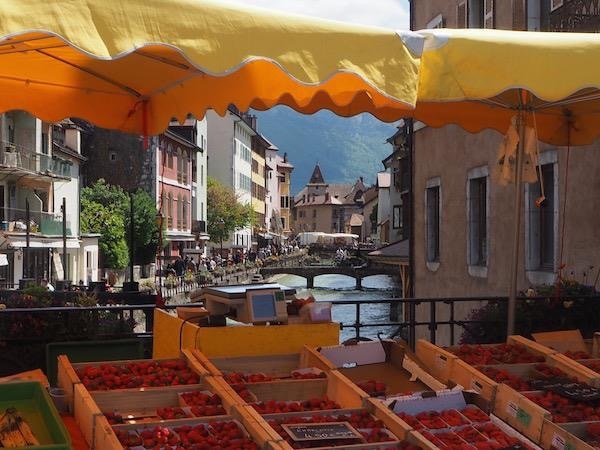 We have worked in towns like Annecy, France armed with only a camera and a video or out in the wilds of Crete, Greece as we converse with nature rather than listening to the sound of corporate wheel churning. We are privileged to have gorge walls that frame our work space and the open, blue skies as our ceiling. 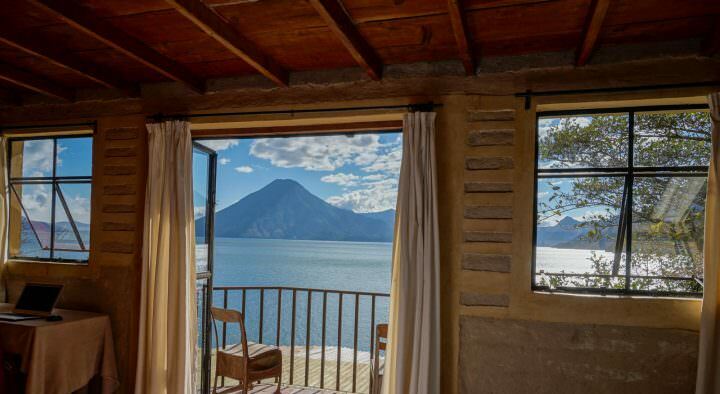 Whether we stay for one day or one week depends on our need to rest from our travels and how much internet we can get. We can sometimes work solidly for days and then we play. Although this really doesn’t feel like work, at least not in the traditional paradigm. And when I say work, let me be clear what that looks like; we film, we walk, we park up and watch the locals go about their lives, we cycle in the name of research and we photograph. And let’s not get too martyr like – this is as much about filling our own memory bank of experiences as it is creating a work output. What a joy; that we can live this life, travel and share our experiences to inspire others to fulfil their own travel dreams. Our philosophy is, travel when you can, for as long as you can and in whatever way you can – just travel. I can’t say that it’s creating a luxury level income, although we see the potential as we build partnerships, connections and profile. And we’re having a blast whilst we’re doing it. This really is the meaningful, heart-centred work we’ve dreamt about all our lives. Can You Tell Us a Bit About Your Certifications & Qualifications? Certification is a really interesting topic as it has shades of the system that we left behind. Although we have learnt in our 17 months on the road (and I know we’re still babies in this game), that you cannot escape the system completely. There are just some rules that you need to follow and certification, in some fields, is one of them. Tax is another, although let’s not go there. As a newbie coach, back in 2001, I decided to get my qualification with the UK’s Coaching Academy. I managed to secure a bursary, which gave me free access to the weekend residential course and the follow-up Diploma assessment process. These days their foundation weekend is now free to all, although the Diploma enrolment is now $5,100 +vat. If you are paying for the programme yourself, 5-10 bursaries are available generally awarding $1,275 towards the costs. To add to this, I found an accredited, on-line Life Coaching Diploma with the Newcastle College of Further Education that was sponsored by author and coach, Fiona Harrold. This course now runs at $765 and has multiple entry levels throughout the year. Achieving my two Diplomas, I received the credibility I need as a fledgling coach to set foot in a potentially massive market. Interestingly as I sit on the sidelines of some ‘coaching’ FB groups, I feel concerned, with my traditional coaching hat on, about the modern take on coaching. Today’s market is flooded with wanna-be coaches who are influenced by this ‘Get rich quick’, ‘Earn six figures a month’ coaching philosophy that misses the heart of what a coach is and does. My perspective is that to be a coach is a privilege and a skill, and the modern wave of fix-it-all coaches worries me. Although before I get on my soap box, I would like to emphasise that training in the basic coaching concepts is vital, if this is a route you’re considering. Learning and embedding coaching’s core values are imperative if you are going to harness the power to help shift someone’s life. So find a course that’s run in your own country and arm yourself with the core skills and build from there. For our travel blogging, there are no exams, just passion and art combined. 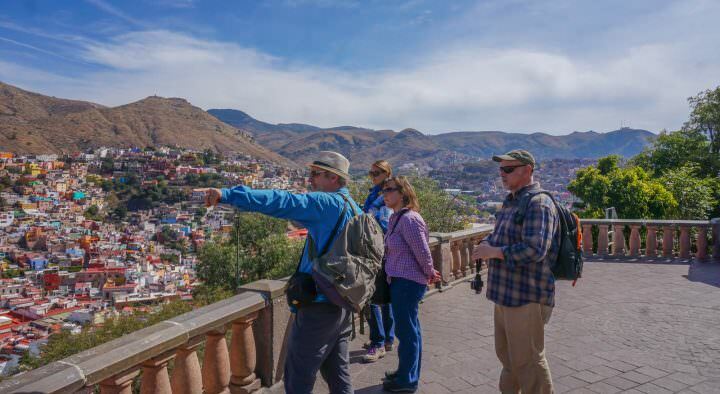 There are courses you can take to learn about travel photography or to be a travel writer, although I think much of this is about a love for expressing what you experience, through words, lens or recording. I guess if you want to be taken seriously in the industry, then advancing your skills is necessary and we are painfully aware of our gaps with, say Social Media. Although our rewards so far have been due to hard work, content creation and persistence. Our work strategy is, on the whole not work we have to find. In many ways we are fortunate, as it finds us. My coaching is the only one where it would benefit from a more direct marketing approach. Although, as I said earlier, with the latest FB groups being deluged with wannabe coaches, it’s not the place I want to pick up clients. I want to find authentic sources of work that nourish me and not get caught up in this ‘Jump on a discovery call’ approach which seriously doesn’t work for me. How Do You Find Clients For Your Coaching Business? So where will my clients come from? Well, today I follow the exact same pattern as 17 years ago; I write articles for magazines, either as advertorial, which I pay for or editorial that is mostly free. 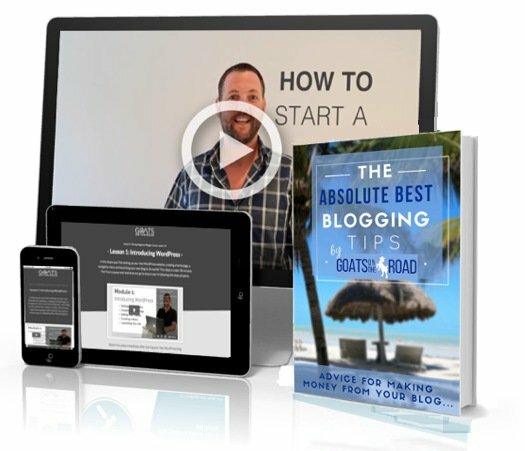 It’s about creating good quality, free content that builds up a virtual relationship with my potential audience. I also create articles for on-line magazines that raise my profile and I get in touch regularly with the official magazine industry offering my stress to happiness angle to publish to their readers. This is a frustrating aspect of our work because you rarely get the courtesy of a reply, let alone an article published. So I guess it’s not an exact science. You have to show up with the right message, to the right people and be in the space that they occupy. Keep resilient, hold the faith and persevere. What About a Working Visa? Do You Need One Where You’re Travelling? For us as U.K. Residents there are no visa requirements to do our work in Europe. Being resident whilst still travelling full-time abroad means that as long as we pay our due taxes, have significant family ties in U.K. and own property, we are operating legitimately within the system. What will happen post-Brexit is another story. All our content for the moment is free for people to access and all income generated from our website are from advertising sales based in U.K. My coaching clients and book royalties all go through the UK tax system. The only issue that needs to be considered is whether the role you choose needs professional insurance. My last professional indemnity and personal liability insurance was cancelled because I wasn’t spending 6 months in England. So I have had to change my supplier to Hiscox Insurance who have given me the coverage I need for my coaching business anywhere in the world. What Does Working as Online As Bloggers and a Coach Entail? So what does a ‘Day in the life of The Motoroamers’ and a life coach look like? I’m an early riser, so by 9:00 I have already done my Social Media postings, so that my followers have a daily inspiration ready when they wake up. 60% of our followers are based in UK so we’re pretty much always at least an hour ahead. Then what we do next depends on where we are and how the rest of the week is panning out (and I include weekends in that week as there is little daily differentiation for us). If we have good internet, then we concentrate on uploading video and Drone footage to YouTube, writing and publishing blogs and researching our next destination. If we have limited or no internet, then we may head off to ‘work’ in a gorge, a local heritage site or cycle and explore the countryside. And weather and light permitting we will take photos and film what we see and experience. If we’ve saturated exploring an area, then we will do offline work, such as drafting blogs, writing my books and articles for publications. Some days may just involve travelling to our next destination. How Much Does Are You Able to Earn With Your Online Ventures? To answer this, I’ll take each of our two digital income streams in turn as they have different income features. For my coaching work, I charge per session and my philosophy has always been my USP. Clients have the opportunity to pay me what they can either afford, or what value they place on our session together. I set some parameters and then they choose the final payment. Each session is 60-90 minutes and in return they pay anything from $64-$115. They electronically wire money into my business account either at the end of a session, if we have an ongoing relationship, or upfront if they are new. For my book sales, I get a 12% commission on each eBook sold (www.bookboon.com) which nets me $1275 pa. This figure is steadily growing each year, as more readers get to know my work and as I develop more books in my portfolio. For The Motoroamers, our affiliate’s income is an average of $77 / month. We’ve only been doing this for three months, so it is still a fledgling aspect of the business. Although getting a consistent income since Christmas gives us hope, and as we develop our profile and readership we know we can only build on this. Our Social Media following is growing all the time and as we now begin to get some commissioned articles that pay up to $320 per piece, this is the side of our work we really want to develop. I think some of the biggest challenges we face after 30 years in the corporate world is how we manage our time and the hours we work. When you love what you do, it can be hard to stop when you have no office structures in place. We’ve always been conscientious and we don’t do anything unless with complete effort. That can work against us in a digital and remote context as we MUST self-manage. There’s no definitive on this for us, as sometimes we don’t work more than a couple of hours a day, whilst others we may work 12. It’s in our own hands. What Are The Pros & Cons Of Working Online? So how do we sell our life and work-style? Well, this bit is easy; imagine wandering around the world experiencing its magic, breathing in its beauty and then sharing that with others. How cool is that? Then add the bonus of being able to sit by a pool or on a beach with sand between your toes as you write your latest book or blog post. How about the value you would get from inspiring others to live their dreams and live beyond their fears, surely that has to be high on the Pros list? And we can’t miss freedom off the list. The ability and choice to work when we want, on what we love, for as long as we want, is a joy. And we are so much happier now than we were back in our old lives. And for a vast majority of the time, we are meeting amazing people, living outdoors and getting to see some of the most amazing scenery in the world. That takes some beating. The cons? Well that’s quite easy too. We’re not earning as much as we were back in the system. We were earning a six figure annual income and whilst that paid the bills, it didn’t give us the freedom or health, more importantly, that we now have. There is no quick win in this game. It’s a bit like Myles’ stocks and shares, we’re in it for the long-haul. It takes dedication, hard work and positivity to keep going and keep building. This can be tricky when you’re remote. So you might need to make some sacrifices, although if you can keep an eye on the end game and remind yourself why you have committed to this lifestyle, then you can make it work. And that’s another Con to our chosen work-style – it’s just us. We live in a 7.5m RV and after 27 years of marriage, we do quite well. although not having anyone else to bounce off can be difficult for some. We’re both introverts so doing our own thing isn’t out of our comfort zone, although it’s not for everyone. Be careful of this, if you’re an extrovert and need to be around others, as it can be lonely. And sometimes this work is frustrating when you don’t get the feedback you hope from a piece of work that has taken you hours to create. If you’re someone who struggles with self-discipline, patience or who needs a high degree of security or certainty, then this work-style will be a challenge. There is little structure, except the boundaries we set. So you can become obsessive over your work, or conversely lack the motivation to do what you need. The Cons might be shaded black or grey, although it’s so important to know what you’re walking into. We’ve run our own business for twenty years, so we had a pretty good idea what to expect when we started this from scratch. Why Do You Love This Lifestyle? I love my life. After too many years of feeling stuck, stressed and ill, making some big life-changes was essential to mine and our well-being. I can do what I love, creatively, with freedom and for the ultimate purpose of helping others fulfil their dreams, there is nothing better about that life. I have grown so much in the last 15 months and I will surely continue to do so. Whether it be through my work contribution or by throwing myself into a country’s culture, I am richer for the choices we made. I have no regrets. To coin a phrase that seems a bit glib, ‘We are living our dreams’. And we are still working our dreams too, putting back something into this fabulous world that we are so privileged to walk around. If there is one piece of advice that we would both give you, it would be to just do it. Don’t try, because as Star War’s Yoda says, “Do or don’t do, there is no try.” Life is short, the world large and beautiful and your life’s purpose too important not to give this a whirl. Don’t let your fears, uncertainty and doubts squash your dreams and aspirations. Live your life beyond fear, follow your heart and trust what happens. If it doesn’t work out, at least you can say you gave it a go. Put your courageous armour on, put your excitement in the reigns and set your wheels in motion. Karen and Myles are a middle-aged, fun-loving couple who swapped The Matrix, for a life of travel, fuelled by curiosity and adventure. In our chariot, Scoobie, we roam the world looking to capture culture, nature and diversity so that others may experience the joys, through our eyes or their own. As travel commentators we are committed to delivering seriously entertaining travel and help you live the life you deserve. Follow their journey on their websites Love My Happy Heart and Motoroaming. Check them out on social as well at Facebook, Twitter, Instagram and Pinterest. I love the post! Karen and Myles are such an inspiration, it is really amazing that Karen decided to nourish her introvert side and dedicate more time to what they love, I’m really all about online jobs, since you have your own schedule, even though Karen is right you absolutely need to self manage it order to do your job and in this case, travel.